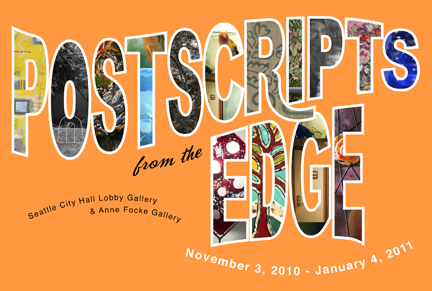 An exhibition in partnership with the City of Seattle Office of Arts & Cultural Affairs showcasing the dynamic artwork of 13 graduates from the 2009 Artist Trust EDGE Program. Come see over 30 works of compelling art by this diverse and exciting group of emerging and mid-career artists working in a variety of media to capture the many facets of life in Seattle. Participating artists are Kathie Bliss, Tracy Boyd, Minh Carrico, Jeanne Dodds, Jessica Dodge, Miguel Edwards, Sara Everett, Joy Hagen, Lin McJunkin, Victoria Raymond, Tom Schworer, Anne Simernitski and Juli Sipe.